The founder of the English Defence League has been jailed over comments made on camera outside a court building which had the potential to derail a long-running trial. Tommy Robinson filmed himself during an hour-long rant outside Leeds Crown Court which he streamed on Facebook Live and was viewed a quarter of a million times. A judge who locked the right-wing activist up for 13 months for contempt of court told him his actions may cause the sensitive case to be abandoned. The court heard it could cost taxpayers “hundreds and hundreds of thousands of pounds” if a re-trial has to be held. A strict order is currently in place temporarily banning publication or broadcasting details of the long-running case or anyone involved. Details of the case will be allowed to be revealed later this year. Robinson was arrested after naming defendants in the case, the charges they face and details of the allegations. He also filmed defendants and confronted them as they were entering the building on Oxford Row. The 35-year-old was held in the court cells before being taken into the court to face trial judge Geroffrey Marson, QC. The judge explained why Robinson’s actions had been in contempt of court. He said the order had been made to ensure the “integrity” of the case. The judge said: “Nothing may occur which will prejudice the trial. The video footage was played to the judge in court before he dealt with Robinson. He said: “He was approximate to where defendants go in and approximate to where jurors go in. “He was making a video. He was referring to this case. The court heard the footage had received 250,000 views and a story about Robinson’s arrest was the lead article on a national newspaper website. Judge Marson said: “Not only was it a very long video but I regard it as a serious aggravating feature that he was encouraging others to share it and it had been shared widely. The lawyer representing Robinson said the right-wing activist will be in danger of being killed or seriously assaulted by other inmates while in custody. Robinson – who pleaded guilty to the contempt of court charge – appeared before the court under his real name, Stephen Christopher Yaxley-Lennon. His barrister, Matthew Harding, said Robinson now felt “deep regret” after realising the potential consequences of his actions. He said: “I have to be realistic in relation to the submission that what he did was provocative in challenging individuals. Mr Harding said Robinson was aware of the reporting restriction in place in the case but thought what he was saying on camera was already in the public domain. The barrister added: “He was mindful, having spoken to others and taken advice, not to say things that he thought would actually prejudice these proceedings. Mr Harding said Robinson had served time in prison before and had been the victim of assaults in custody. He said there had been “a price on his head” during his last prison term and inmates had been offered the reward of drugs and mobile phones to kill him. At the time of the incident, which happened last Friday, jurors were in the process of considering verdicts after hearing six weeks’ of evidence. Judge Marson told Robinson that only an immediate jail term could be imposed as his actions had been so serious. Robinson has a previous conviction for contempt of court. He was the subject of a suspended prison sentence, imposed at Canterbury Crown Court, for committing a similar offence by filming inside a court. Robinson has a criminal record dating back to 2005, when he was convicted of assault occasioning actual bodily harm. He also has convictions for possessing drugs, threatening behavior, disobeying a court order, possessing identity documents with intent and fraud. Robinson, a married father-of-three, founded the English Defence League in Luton in 2009 before resigning in 2013. The organisation was responsible for violent marches on the streets where members clashed with police and counter-demonstrators. The MSM for a stRtyis certainly not right wing biased…. most definitely 120% left wing biased….. have no idea what tv channels or newspapers your watching/reading but they are c most certainly not British, the most corrupt, lying, fake left wing news you could possibly get. You yourself have just twisted your news in Tommy. Where is all the bits where he was told he was not being charged, told he didn’t need “his lawyer”, then told his charge was for breach of the peace, his personal lawyer called the station to be told she needn’t go to see him as he wasn’t being charged to then be told he is being charged with contempt of court and given a lawyer who had never dealt in the legalities of this kind of case. There is so much more and the names, addresses and the alleged crimes of the said men had been printed by the BBC and other media outlets. The trial had already been done so would not or could not collapse and it was only the sentencing of the men that day which was to be done. Tommy Robinson is no racist. 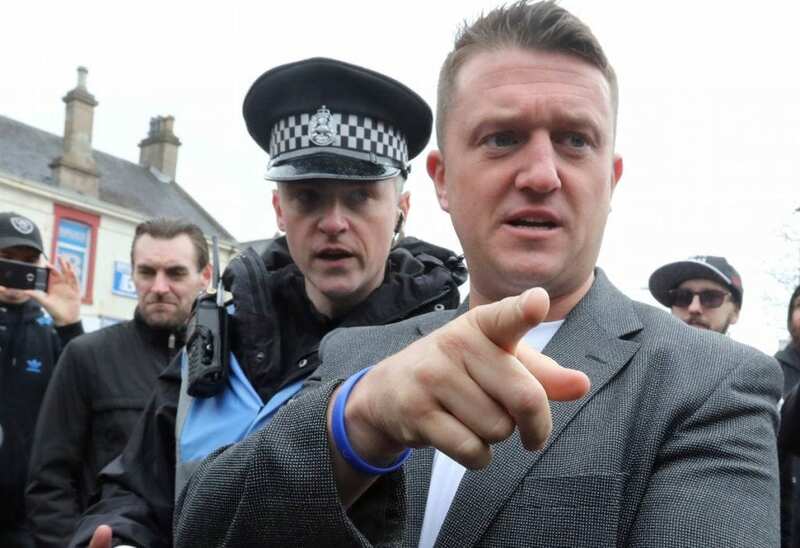 Most of any Pritest lead by Tommy over the last 8 years have had very little violence and any that they have been has been instigated by the “left wing Nazi brown shirts” ANTIFA who cover their faces, bully and intimidate any person whose view is different from theirs…. so whose the violent racists???? You have obviously not done your “proper truthful investigating into Tommy as you would know he is not out for hate or racism or anything violent but obviously you don’t sctually want the truth as so you can instigate hate and racism towards a people of different views to yours.